31422776How to block spying - 15 secs Jump to media player Human rights group Amnesty International has released software to stop governments learning secrets from your computer. How to map the ocean floor - in 15 secs Jump to media player Filming the ocean floor around Brazil's tropical island of Fernando de Noronha for Google's underwater Street View. Robots to be given the 'Ikea test' Jump to media player Artificial Intelligence experts are devising a new way to test machine intelligence. Could this robot improve empathy? Jump to media player A robot which reacts to the way people speak to it and each other could change their behaviour. The US Navy is testing a robot that can put out fires. 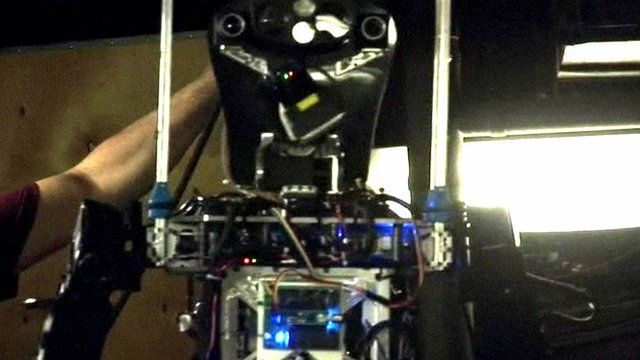 The Shipboard Autonomous Firefighting Robot resembles human form and is designed to go where humans are unable to. At the moment it must be controlled by a human operator. But scientists want future versions to be able to detect their surroundings and react for themselves.